A guide dealing with the practical problems faced when talking to and trying to communicate with a child who has been through distress and conflict situations: How to build trust? What to do when we feel that the child is uncomfortable while talking to him? It includes 12 chapters, with an annex on workshop management, as well as useful references. The guide provides information, recounts experiences and proposes exercises on such issues as communicating, introducing, expressing emotions, dealing with communication obstacles, offering support and advice, talking about bereavement and separation, talking to disabled children, working with groups, talking to the family, organizing support, managing a workshop, etc. 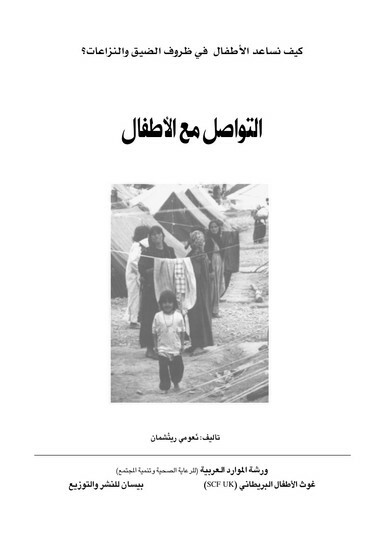 Author: Naomi Richman; translated by Afif Al-Razzaz; revised and edited by Ghanem Bibi and Youssef Hajjar.